~"Finally! A Christ-centered devotional that encourages my faith and gives me a deeper, biblically sound, understanding of who Jesus is. This is exactly what I have been looking for! A welcomed addition to my day and a bright start to my morning routine! Greatly appreciated!" ~"Well written. Thought provoking. Concise, but convicting. Thank you!" ~"I follow the Facebook page and listen to John Stange's podcasts. This is another great resource that I'm finding quite helpful. Collecting each volume because I like to read more than one each day." Following Jesus is the greatest privilege of our lives. He has made it possible for us to grow closer to Him and stronger in our faith as a result. Jesus came to this earth and took on flesh, lived the perfect life, died death in our place to pay for our sin, and rose from the grave. In doing so, He secured victory over sin, Satan, and death and He shares His victory with all who trust in Him. Jesus lives in perfect unity with the Father and the Holy Spirit - one God in three Persons. Jesus is the Lord, Messiah, Savior, and ultimate hope for humanity. We were created to worship Him, walk with Him, and bring Him glory forever. He loves us and He assures His followers that He will be with us always. All Scripture is pointing our hearts toward Jesus and in the pages of this devotional series, we'll be looking at various Scriptures from both the Old and New Testaments and learning more about what it means to apply those Scriptures to our lives as an expression of our faith in Jesus. 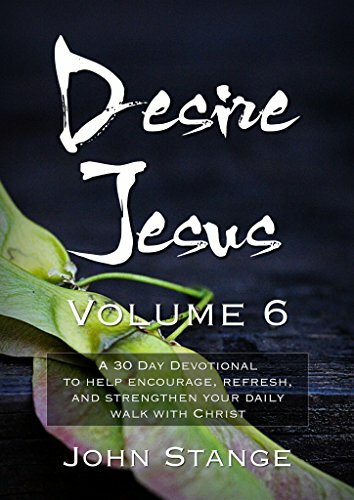 Our prayer is that Jesus will use the content of this devotional to encourage, refresh, and strengthen you in your daily walk with Him.